When moving the fish to the grill, keep the skin on it. This will help hold the fillet in one piece, making it easier to maneuver during the cooking process. Some fish also produce delicious, crispy skin on a grilling surface. Marinating the fish gives it a great flavor and helps keep the fish from sticking to the grill. Oil and herbs with a little citrus can be great marinades for many different types of fish. Make sure not to marinate the fish too long as the acid in the marinade will begin to cook the fish. Having fish stick to the grill is a nightmare. To avoid this, make sure that there is plenty of oil on the fish itself as well as on the grilling rack. If the fish is marinated in oil, it is not necessary to re-oil the fish itself. If you are cooking a fillet, chances are that the thickness of the entire piece of fish is not even. This will cause uneven cooking and increase the chance of the thinner portion being burnt or the thicker side being undercooked. A simple solution is to cut the fillet into more even portions. A fish basket is designed to make grilling fillets an easy process. The basket basically encloses the fish on all sides, which makes it easy to flip and move around while it is cooking on the grill. Make sure to oil the basket as well as the grill rack to keep the fish from sticking. Steaming is not a typical grilling method, but it works great with fish. Create a simple foil pouch that can be filled with fish, lemons, herbs, or any other vegetables that are desired. Make sure to oil the pouch before adding the food. Be careful of the steam inside the pouch once the food is cooked. Cube the fish and create an easier way to flip the fish while it is cooking. Make sure to use flat skewers that will hold the fish in place and be creative with colorful vegetables. Wooden planks are a great way to cook fish without worrying about the fish sticking or falling apart. There is no need to flip the fish when it is cooked on a wooden plank. 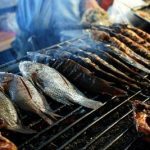 You will miss the traditional char of cooking on a grill, but the wood infuses a smoky flavor into the fish that cannot be accomplished otherwise. Make sure to soak the plank in water for at least two hours before grilling so that it does not become fuel for the fire. Herbs add great flavors to fish, but when fish fillets are being cooked on the grill, herbs can also help to keep them from sticking to the surface of the grill. Toss the herbs in a marinade before placing them on the grill so that they do not stick, then place the fish directly on top of the bed of herbs. Thyme and rosemary are a great addition to many types of fish. Grilling fish can be a frightening proposition, but when you consider all of the different methods for simplifying the grilling process it’s made a whole lot easier. Try some of the tips listed above the next time fish is on the menu to create the perfectly succulent grilled delight.